SOURCE has always been the number 1 choice to store, carry and drink water on the go. Like no other hydration system, your liquids stay fresh and without any taste thanks to our GlassLike, GrungeGuard and TasteFree System. What’s the advantages of the new Filtering Hydration Kits? If you’re trailrunning in the desert, mountain biking in the Swiss Alps or thru-hiking one of the long US trails: You’ll need a smart hydration solution. SOURCE adds a new option for Summer 2016: don’t carry all the liquids from your home-base. Re-fill and filter your water on the go with one of the new Filtering Hydration Systems in cooperation with Sawyer. Who are the new SOURCE Filtering Hydration Kits for? If your outdoor habitat is the desert or any other similarly dry and arid landscape, you use your SOURCE to store your liquids, carry and drink on the go. 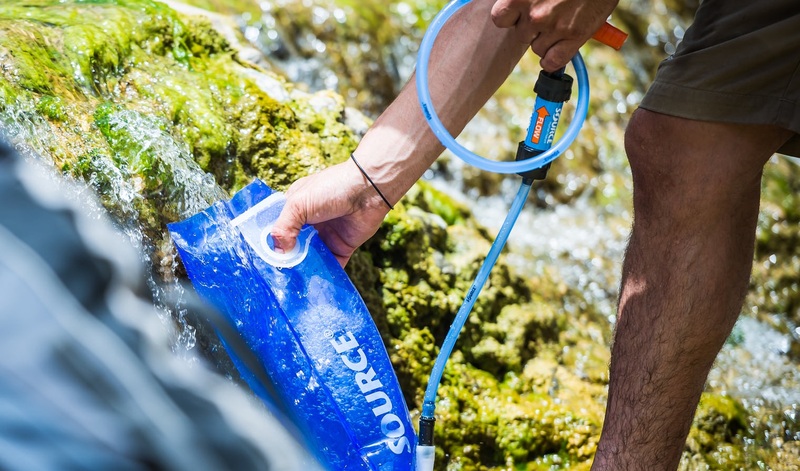 SOURCE Widepacs are designed to be the most practical hydration systems and if need be, water will stay fresh in your SOURCE for days and weeks (confirmed in many independent tests, magazine and blog reviews). If you are out in the green woods and fields or climbing in the glacier and crossing mountains above the treeline, we’re adding a new option for you: Go light on the weight, carry limited amounts of liquid – and re-fill your bladder on the go, filtering as you are drinking on the move. Re-fill your SOURCE Widepac in seconds from any fresh-water creek, pond or lake, thanks to the patented SOURCE wide slide opening – and you’re back on the trail in no time. Thanks to the Filtering Hydration Tube you’re drinking 100% safe water. The proven technology of the Sawyer Filter allows you to filter up to 100,000 gallons of water – carrying the extra weight of the filter of just 2 ounces. No chemicals, no tablets, no purifier needed. The Sawyer filters are backflushable almost indefinitely for cleaning and re-setting, that means you will not need to replace any expensive cartridges. The filter removes the bad taste of bacteria, dirt and green matter, including 99.99999% of bacteria and 99.9999% of protozoa. Making sure you stay healthy and hydrated all the way.